This post is part of the Sea tour by Traveling to Teens. About the Book: As a surprise for her birthday, Sienna's father invites Sienna to be part of Team Hope's trip to Indonesia-the same place her mother's plane disappeared over the Indian Ocean three years before. Team Hope will be spending two weeks working at an orphanage and helping children heal from the tsunami that tore through their country six months before. While there, Sienna connects with Deni. Both haunted by nightmares from their past, Sienna and Deni help each other heal in ways they never imagined and together they find the answers they were searching for. GreenBeanTeenQueen Says: Love, Love, Love it! I love books with romance, but sometimes the romance genre feels oversaturated with paranormal or new girl falls for hot guy who finally notices her storylines. 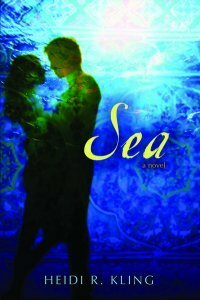 Sea stands out among these romances and is a breath of fresh air. In Sea, you'll find a wonderfully lovely story about a normal girl-and this girl actually travels the world and helps people! Sure, she's reluctant to at first, but what I loved about Sienna is that she goes for it-she joins Team Hope and travels to Indonesia and steps out of her comfort zone. She made me want to jump on a plane and find a Team Hope of my own. What really made Sea stand out for me though was that the unique storyline could have gotten very preachy about helping others, joining service projects and doing good. But it never does-this is more Sienna and Deni's story about finding and helping each other-and it just happens to be in a more exotic setting with a unique premise. This is much more than a contemporary love story-it's a story about two people thrown into hard situations and making it through and the healing that can come after tragedy. Even if you typcially shy away from books with romance, give this one a try-I think you'll be surprised! I do wish we could have gotten more information on the orphange and Deni's concerns about the owner, but I do that stayed true to the fact that Team Hope was only there for two weeks-they couldn't change everything. I don't want to give away any spoilers, but I have to say that I loved the ending-it was just right and I really loved how everything came full circle. Sometimes when an author tries to pull of an ending like the one in Sea, I want to throw the book across the room because it just doesn't work. But Ms. Kling makes it work and it left me happy and there was no book throwing-she pulled it off perfectly! I stayed up late reading Sea because it was a book I couldn't put down. It starts out innocently enough and I thought "I'll just read one chapter"-but this one pulled me in and once I started reading, I couldn't stop. Sea ranks at the top of my debut book list for 2010 and should be added to everyone's must read list. I'm always interested in a good romance, especially with the market flooded with them. I'll have to pick it up. I had this one on my wishlist already as I loved the sound of the premise. Now I'm really pumped for it. Not sure when it's out in Australia though? it's been a LONG time since I last read a cute YA normal girl/normal boy romance. I'll have to check this out! I can't wait to read Sea! I'm glad that the love story is refreshing. Sometimes it's hard when you read a lot of books in the same category; so many of them start to blend together. Standouts are increasingly hard to find when you're reading so much YA. Gotta read this asap! Fantastic review! I have been wanting to read this ever since I found out that it dealt with the tsunami. I have a feeling that it will be a favorite of mine too. I've heard some buzz about this one lately and definitely think I would enjoy it. I'll add it to my summer wishlist! Thanks!